Yes, it’s been an extremely long time. Life, studies, and other financial pressures had put the label into hiatus in late 2005. Plans to release some records (Scatter, Nalle, Lied Music) fell by the wayside and things dragged on and on and on. 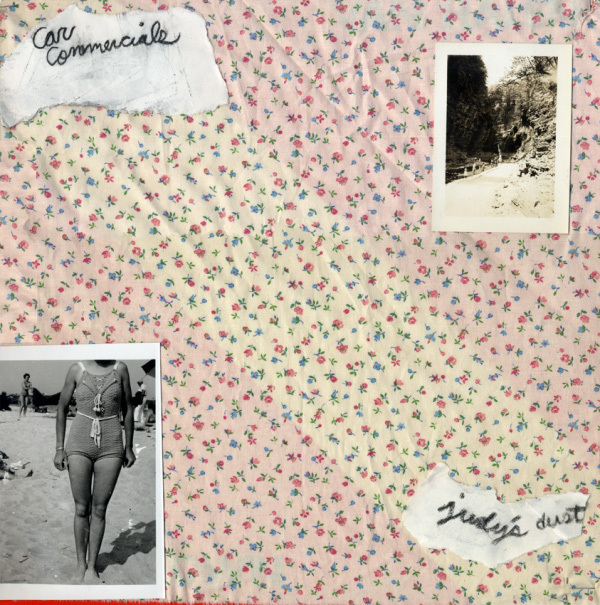 But, anyway, we are proud to announce the release of Cenotaph #014, Judy’s Dust by Car Commercials. This record will be released mid-April in a limited edition of 300 vinyl copies. A select handful will be done up as deluxe ‘art’ editions, as a throwback to the very first record we released back in 2000. More information will be posted here as we get them assembled and ready for sale, such as links to places to buy it, sound samples, etc. As well as some site housekeeping and redesign. -Car Commercials Jar (Leaf Leaf): After three brilliant tapes in which even the band’s tuning-up and tinkering about sounds brilliant and this fantastically off-the-wall single, I want to hear what the band throws in the b-side trash can. This time around, the band hikes to deserts of disturbed whispers and piano interpretations of the feelings generated by The Shadow Ring’s Lindus. The band also finds time to crank out a primitive power pop hot rod with D.I.Y. art rock colorings.”Rest Stop” even references the monologue on the b-side of Alternative TV’s Vibing up the Senile Man. Mondo mind-bendin’ with LAFMS-style communication breakdowns and an isolationist’s lack of self doubt. In the meantime please check out Car Commercial’s parent label, Leaf Leaf Records. Thanks for not forgetting about us! We hope that releasing LPs will be a more regular occurrence, at least more than once-every-three-years. Keep checking here for more updates. The summer is beginning and we’ve been lucky to see a lot of great music in the past two months. The Subcurrent festival in Glasgow was stunning, and the Sonic Protest festival in Paris was equally great. We’re still sorting out our priorities as far as releases and schedules and money and all of that boring stuff, but we hope to get the label back on track soon with releases by Lied Music, Nalle and Axolotl. Please note that the audio@cenotaph.org email address will no longer be used; to contact us, please use the form on the “Contact” page at the bottom of the site. You are currently browsing the Cenotaph weblog archives.